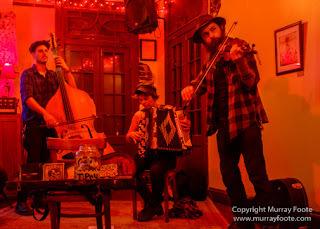 G String Orchestra, a traditional and inspired Klezmer, Eastern European and modal music folk band, began as the G String Quartet in the spring of 2006. 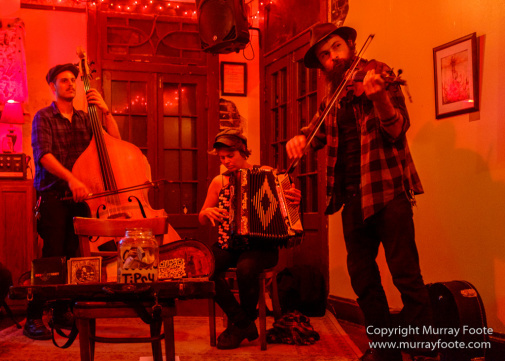 Basing themselves loosely between New Orleans and Alaska, their music has brought them to the far reaches of this planet in modes of hitch hiking to biking, car riding to jet setting. They've ranged from two to ten members playing in everything from dive bars to street festivals, restaurants to parties, weddings and celebrations galore! They began as the accordion and violin duo, Dem Triskers (Sarah and Ian) and now are a core of three people, violin, accordion, and bass. However, the band has undergone many incarnations over the years existing as a simple trio, to a five piece band to sometimes a ten piece ensemble, featuring instrumentation such as guitar, viola, banjo, cello, washtub bass, washboard, drums, trumpet, trombone, saxophone and even piano. Each additional person has added their own influences and experiences to the band, giving flavors of punk, blues, Americana and New Orleans Jazz, resulting in a music to make you cry, music to make you dance. Music to get lost in the reverie. They play often on the streets, so as to reach a variety of listeners, but can also be found providing the musical atmosphere for dinner occasions at restaurants and catered events, listening rooms, coffee shops, bars, clubs of various aptitudes, and in livelier moments have been known to even get up on the tables and bars keeping the audience dancing past closing hours! 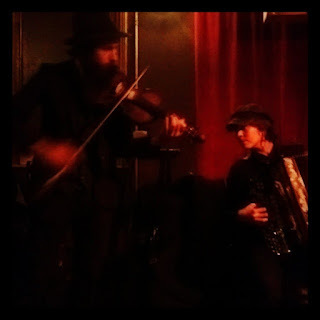 To see our upcoming shows please visit www.facebook.com/gstringorchestra and click on the Events tab.